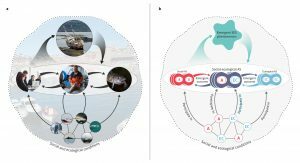 Social-ecological systems (SES) are complex adaptive systems in which system-level behaviour emerges from multiple interactions between diverse people and heterogeneous ecosystems at and across scales. 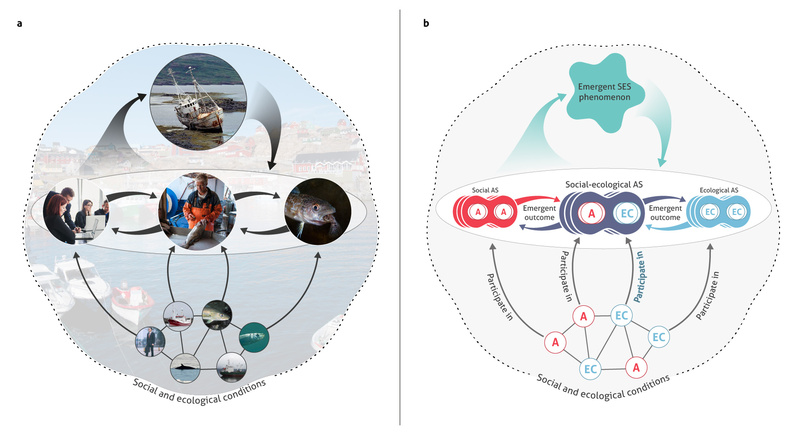 We propose a framework composed of interlinked social-ecological, social and ecological action situations to develop hypotheses about those interactions that may have generated a SES phenomenon of interest. To this end we extend Ostrom’s concept of an action situation (Ostrom 1990) to include non-human actors such as organisms or elements of ecosystems. These entities can be for instance part of a harvesting social-ecological action situation or of a predator-prey relationship in an ecological action situation. Action situations produce emergent outcomes that influence other action situations. Together they give rise to the phenomenon of interest. A network of linked action situation thus represents a hypothesis of the human-environment interactions and their embeddedness in social and ecological processes that may have generated the phenomenon of interest. It can then be tested in an empirical study or through dynamic modelling.